It took me a couple of tries to figure the technique out. 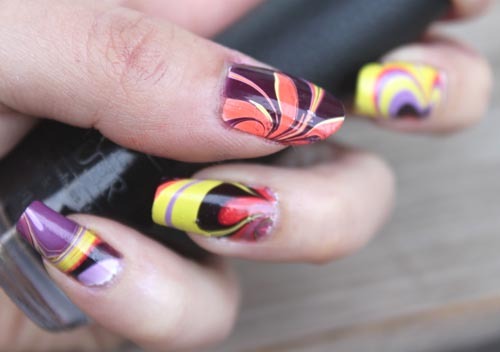 But once I did, it was so cool to see the patterns appear on each nail! And I promise, it got easier with practice. The trick I learned right off the bat is that it is VERY important to use room temperature water in a smaller sized dish. It can be a Tupperware container, plastic cup or shot glass. Just make sure there’s enough space to dunk a finger (or two) at the same time. But not too much space or the colours will spread too far. I also had to experiment with a variety of different nail polishes to find ones with just enough density to float. Originally I wanted to use black, but my polish was a little too thin. I started by painting all of my nails white, which helped the other colours appear brighter. 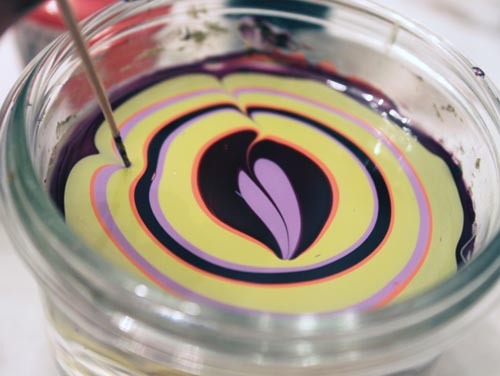 I found it also very helpful for the water marble pattern to transfer onto a mostly dry base. Therefore, I waited roughly 15 minutes after painting my nails with this first coat before ‘diving’ into the fun part. While waiting, I taped around each nail to protect the surrounding skin from catching excess polish. For this look I chose to use four different colours: orange, dark purple, light purple and neon green. A.k.a. my interpretation of Halloween colours. Another trick with this technique is to work fairly quick. I found it handy to have the lids of each nail polish bottle unscrewed and ready to use. 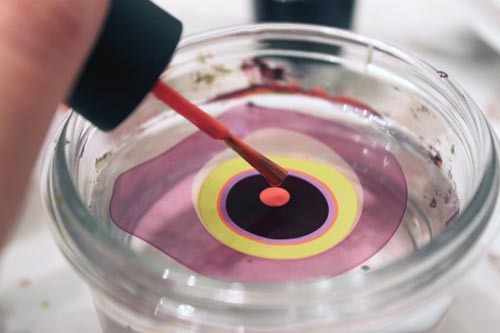 One at a time, I placed droplets of colour onto the surface of my room temperature water, being careful not to hold the brush too high or else the polish would sink to the bottom. I used the ‘bullseye’ design, which is created by dropping one colour in the centre of another, repeatedly until it looks like a shooting target. The next step was also a bit of a learning process for me. Using a toothpick to ‘draw’ my design, I realized that it is imperative to not begin from the outermost edge. By the time I had finished creating my bullseye, the largest ring (the first colour we dropped) would be dry and appear to have a gummy texture. It would stick to the toothpick and just make everything very sloppy. Instead, I started a wee bit closer to the middle, which created much smoother lines. Aiming for a pattern that I thought would look neat on my nail, I dunked my finger into the water. One more tip I learned: try to keep your finger on a 45 degree angle to avoid air bubbles. While my nail was in the water, I used a toothpick to remove the remaining polish from the surface and around my finger. 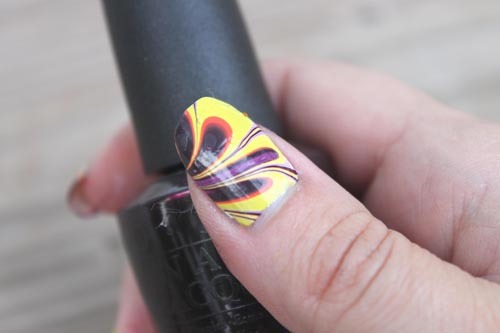 Once the top was clear, I pulled my nail out and took a look and marvelled at my design. 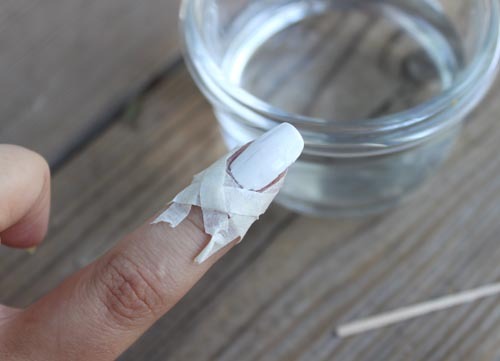 Finally, I removed the tape from each finger and used a Q-Tip with some nail polish remover to clean up any areas of skin that may have been smudged during the process. I was so shocked at how many compliments I received from this manicure. Family members, friends and even strangers seemed so intrigued. It was quite fun to tell them “no, they’re not stickers” and then giggle inside at how simple the nails were to create. There may not be ghosts. Or blood. Or cobwebs. But I think this nail art is a more generic way to show Halloween spirit. Or…how psychedelically cool would it be paired with a 70s or disco themed costume? 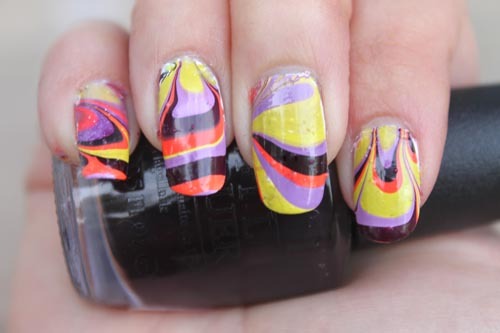 Otherwise, the colours can easily be changed and it can be worn as an eye-catching manicure at any time of the year!